There were plenty of ‘headlines’ in the recent Budget from Chancellor George Osborne. But, sometimes, it is the smaller bits of detail that matter most to businesses and individuals. For example, here’s a short round-up of what the Chancellor had to say about tax and travel matters. The taxable petrol and diesel car benefit is based on the car's CO2 emissions. It is calculated using the car's UK list price and applying the 'appropriate percentage'. The car fuel benefit is calculated by applying the same percentages to the fuel benefit charge multiplier, which for 2015/16 is £22,100. Fighting-fit Kathryn shows cancer who’s boss! A fighting-fit health board executive is defying the odds after undergoing cutting-edge new cancer treatment which has shrunk her tumour by half. In January, Kathryn Davies, 47, was diagnosed with Exon-19 deletion, a rare non-inherited genetic mutation which caused primary cancer to grow in her lungs and secondary cancer to spread to her brain. But after just two months of targeted ‘precision medicine’ treatment - which involves her taking chemotherapy tablets every day - Kathryn is now completely free of secondary cancer, while the tumour in her lung has shrunk by 50%. And Kathryn, who is Executive Director of Commissioning, Therapies and Health Science at Hywel Dda University Health Board, believes that her dedication to daily exercise and healthy eating has put her in the best possible shape to tackle the disease. She said: “I’m progressing really well; my side effects are minimal to say the least, and I continue to be symptom-free. 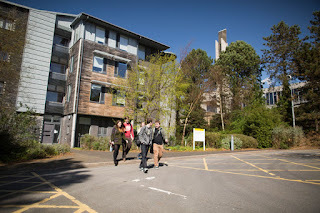 Aberystwyth University’s Penglais Campus has become the first University campus in Wales to achieve the Green Flag Award. The Green Flag Award is a UK-wide partnership, delivered in Wales by Keep Wales Tidy with support from Natural Resources Wales, and is the mark of a high quality park or green space. It is judged by green space experts who visit applicant sites and assess them against eight strict criteria, including horticultural standards, cleanliness, sustainability and community involvement. A record-breaking 110 parks and green spaces in Wales have met the high standard needed to receive the Green Flag Award or the Green Flag Community Award this year. Aberystwyth's Centre for Research into Environment and Health (CREH) won the Software Tools award at the recent 2015 Research Excellence Framework (REF) ‘Impact’ Awards, held by the UK Water Industry Forum. The Water Industry Forum is an alliance of water companies, related consultancies, government research agencies and relevant regulators. The award was presented to the CREH team at an awards ceremony on Tuesday 30 June in the Crystal, Royal Victoria Dock, London. 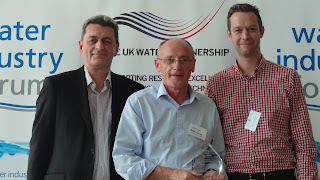 CREH were presented with the award for the team’s work on microbial standards for recreational waters. This covered modelling to develop microbial water quality standards and microbial source apportionment, and real-time modelling of bacterial concentrations to deliver compliance with the new Bathing Water Directive. The awards are a new initiative for the UK water industry and the panel is comprised of senior water industry scientists. A Hywel Dda University Health Board executive is getting ready to put NHS Wales on the global healthcare map at a prestigious medicine and technology summit in Wyoming, USA, later this month. Kathryn Davies, Executive Director of Commissioning, Therapies and Health Science, will represent the health board and NHS Wales at the Jackson Hole Breakthroughs in Medicine & Technology Summit between 31 July and 3 August. The invitation-only event – hosted by Dr. Patrick Soon-Shiong, CEO of Nantworks, and Stefano Pessina, CEO of Walgreens Boots Alliance – has been convened to discuss breakthroughs in medicine and technology that will impact on humanity, industry and economy on a global basis. With notable attendees including former US President, The Honourable Bill Clinton, NHS England CEO Simon Stevens and GlaxoSmithKline CEO Sir Andrew Witty, Kathryn says that she is looking forward to putting NHS Wales at the heart of the debate. Join intrepid explorer Professor Davina Attenborurrel and fearless wildlife wrangler Mike ‘Snakebite’ Erwin as they lead you on a nature trail covering the major continents of the world. A ‘promenade performance’ around the Gardens, this international safari will teach you about animals from all over the world, as well as native British wildlife and the wildlife of Aberglasney. The animals however will be puppets! Very realistic puppets! Each performance will follow a wheelchair/ pushchair friendly route around the Gardens. The number of places on each tour will be limited and so it’s best to book tickets in advance. The show will go on whatever the weather so please come prepared! However, the weather forecast for Thursday is currently 'dry and bright', thankfully! A new Triage and Treat service is now available at selected pharmacies in Aberaeron, Aberporth, Aberystwyth, Cardigan and Newport. The Triage and Treat service can help you if you have a low level injury rather than having to visit a doctor or an A&E department. The service is provided by a pharmacist or a member of the pharmacy team who has had special training and can be used by visitors, holiday makers and local residents, especially when the GP practice is not open. Withybush Hospital’s midwife led service is marking its one year anniversary with a celebratory tea party from 2pm to 4pm on Saturday 8 August. Hosted by our friendly midwives, mums, dads and little ones are warmly invited to join the celebrations, as well as mums-to-be who would like to find out more about the homely and relaxed facilities available and the expert care midwives can provide. The Midwife Led Unit at Withybush, Heverfordwest, provides three birthing suites, including a dedicated birthing pool room, each complete with mood lighting and en suite facilities. West Wales legal experts Red Kite Law have announced the appointment of Neil Walker as Chief Executive. Mr Walker succeeds Andrew Manning, who will remain as a consultant to Red Kite Law. Mr Walker joined Red Kite Law as chief operating officer and finance director last summer. He said: “I am delighted to be stepping into the role of Chief Executive. “We are a forward looking legal firm operating primarily in Carmarthenshire and Pembrokeshire. But we also service clients throughout Wales and have recently opened an office in Cardiff. Mr Walker joined Red Kite Law from Cooperative Legal Services. He is a graduate of Manchester University and a qualified Chartered Accountant. A Carmarthenshire Council trainee from the Tywi Centre in Llandeilo has been crowned Specialist Apprentice of the Year UK. Joe Moriarty won the prestigious National Construction College award for his work in the traditional trade of lime plastering. The Tywi Centre runs the Specialist Apprenticeship Programme with the aim of addressing the skills shortage in traditional trades of stonemasonry, lime plastering and carpentry; working closely with heritage construction companies who provide placements and on-site training. Joe was selected through the Heritage Bursary Scheme which is funded by the Heritage Lottery Fund and Construction Industry Training supported by Carmarthenshire County Council and the National Trust. During the 12 month programme Joe worked with two companies including Just Lime Ltd where he was considered to be such an asset to the team that he was offered a job. Ammanford's 100-year-old tree to get a pruning! A tree in Ammanford which is around 100 years old is to be cut back for safety reasons. The Cedar, which is covered by a Tree Preservation Order (TPO), is sited near the bus station in College Street. Carmarthenshire County Council’s conservation section commissioned a specialist survey for the tree which has an expected life span of between 135 and 150 years old. It followed concerns that some branches could become loose and fall. It is now recommended that some of the long branches are cut back in a way that mimics natural storm damage. The first stage of pruning will not look aesthetically pleasing, however the alternative would have been to fell the tree. Executive board member for conservation Cllr Meryl Gravell said: “This tree has local cultural and historical value, and it would not be desirable to fell it. A vital piece of life saving equipment has been made available at Pembrey Country Park’s cafe bar for its busiest period. The Sidan was chosen as one of the outlets to benefit from a Zoll AED Plus defibrillator - normally used in schools - for the summer holidays. On loan from Cariad charity, the specialist unit delivers a therapeutic dose of electrical energy to the heart, and can increase the chances of survival should someone suffer a heart attack. It also has the ability to audio guide a rescuer through chest compressions. Research shows that 8,000 people will suffer a cardiac arrest outside of the hospital environment every year in Wales. At least 12 young people will die every week and 7 people every hour in the UK. Global Rockstar Productions, a production company from the United States has assembled a cast and crew of South Wales artists to create a major motion picture which features Welsh history and culture. Shadow of the Missing, a suspense thriller, is currently filming in and around the community of Llanelli. 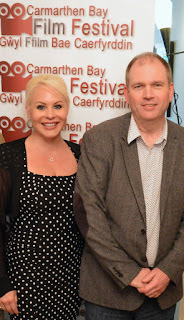 Director Jamie Lee Smith of Global Rockstar Productions fell in love with the area after attending the Carmarthen Bay film festival for the last two years. She then gathered together a group of talented and local filmmakers, comedians, and actors to create a movie that would tell a great story while at the same time bring attention to the scenic beauty and architectural gems which Wales has to offer. Llanelli concert promoter Cerith Owens has a musical treat in store later this year when he stages the Loud Applause Annual Concert – ‘Night With the Stars’ - at Ffwrnes Theatre, Llanelli, on November 7. The concert will feature the dazzling trio of violinists The Singhs and the Morriston Orpheus Choir. The Orpheus is one of the best known choirs in Wales. The choir was formed on April 23, 1935, by Ivor E. Sims and in its early days concentrated primarily on competitions and local concerts. In 1937, the Choir achieved its first success at the Royal National Eisteddfod in Machynlleth, going on to win at the National on six further occasions. The choir does not presently sing in competitions, preferring to concentrate on concert performances. It was never more than a germ of an idea, but after several recent experiences in supermarkets, I had an “Eureka!” moment that helped to clear the fog from my mind and led me to the depressing conclusion that in the 21st Century, the biggest cause of delays, frustrations, stress, fractiousness, headaches, high blood pressure...and people tearing out chunks of their own hair is...progress!